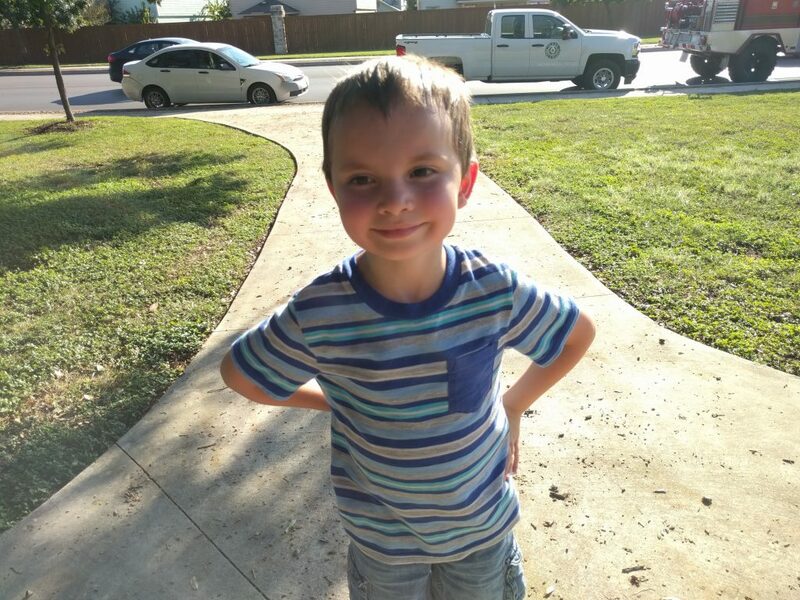 What Joseph’s Been Up To: Mainly school, the occasional homework, and enjoying childhood to its fullest (playing with LEGOS, paying outside, playing dress-up, etc.). 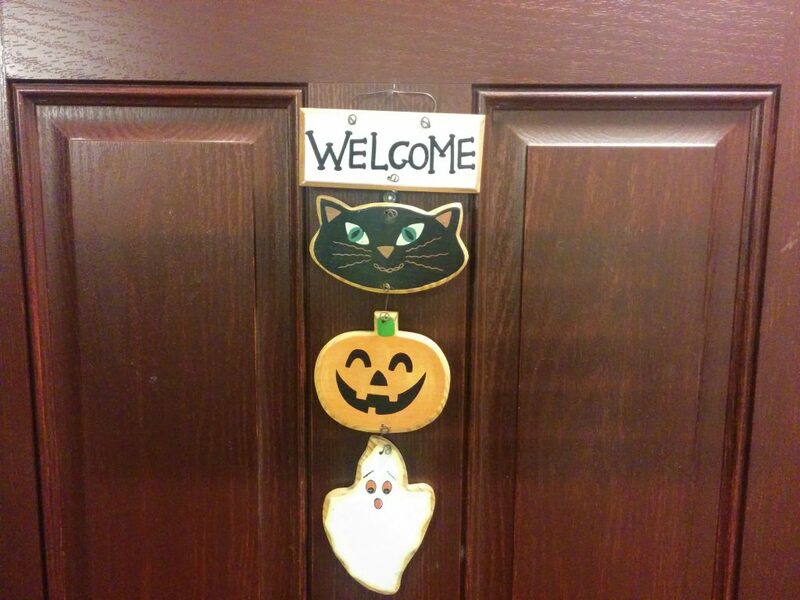 Our tried-and-true Halloween door decoration. 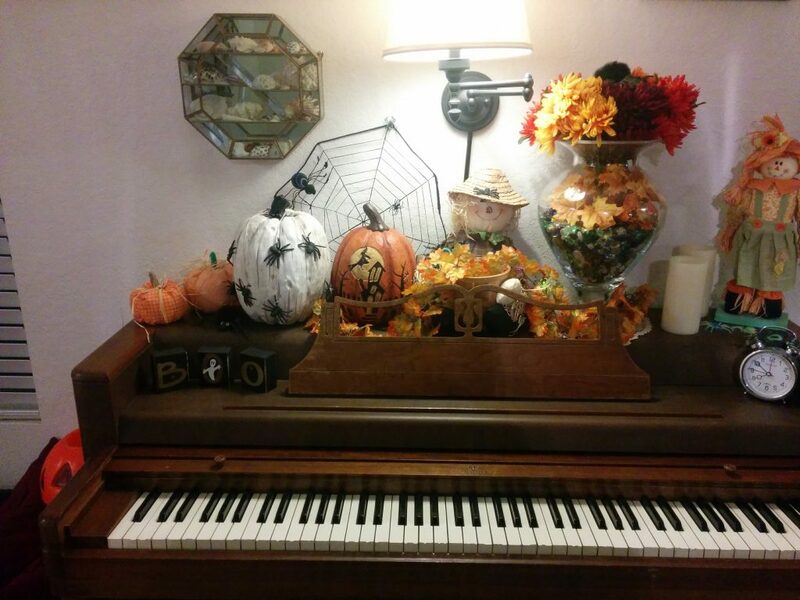 We added Halloween stuff (mainly spiders) to the fall stuff on the piano. I love that I can flip the two craft pumpkins.The white one has a Thanksgiving saying that I keep facing out during September and November. 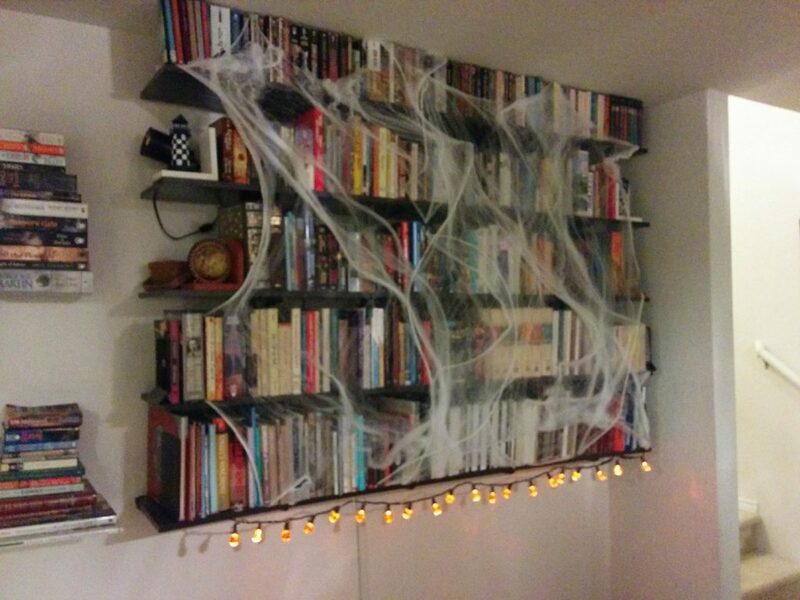 For Halloween, I just flip it around and drape spiders over it. The orange one usually stays flipped around in September and November (so that it looks like a plain orange pumpkin) and then gets flipped in October to show the Halloween scene on it. 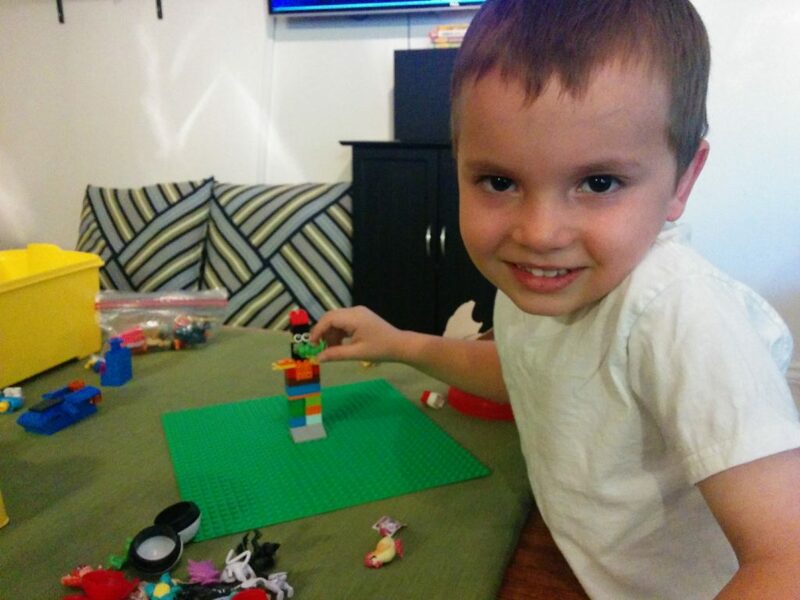 I love multi-functional stuff! 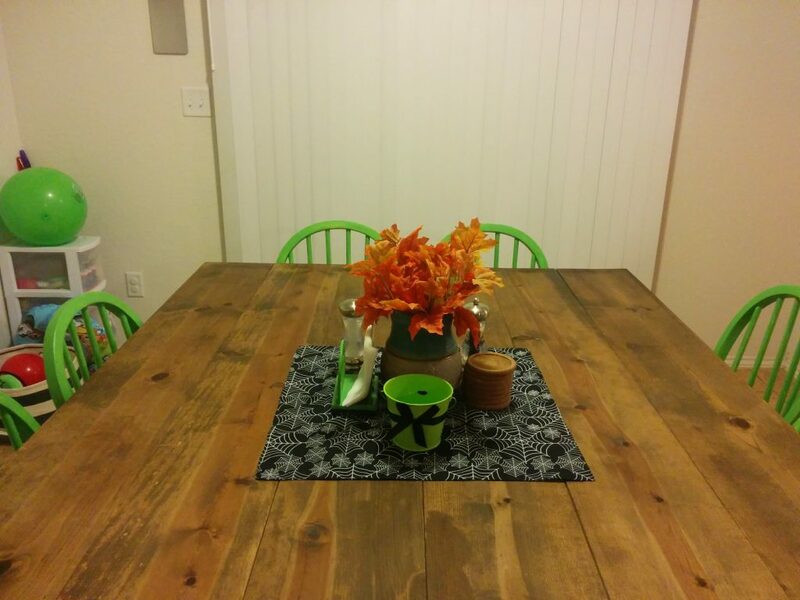 A spiderweb cloth centerpiece and a green and black bucket add some spooky to the table (I also pulled back out the bright green napkin holder since it matches). 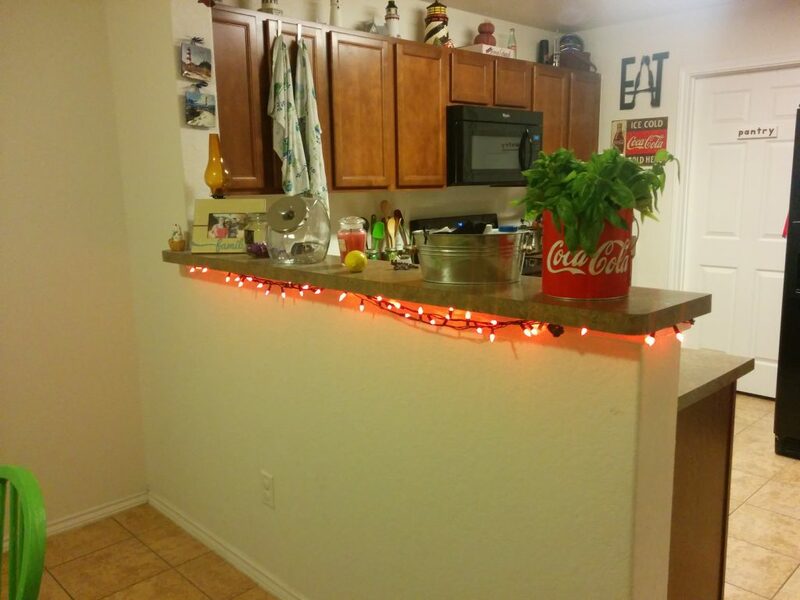 Orange lights under the breakfast bar create a spooky glow. You can also see the massive amounts of basil Paul pulled off my basil bush, er, I mean plant. 😉 I ended up blending it with olive oil and freezing the concoction in ice cube trays so that I can keep it in the freezer and add a bit of basil to things (or make pesto) over time. One of my favorite spots of the house. I love when Paul does this to our bookshelves. 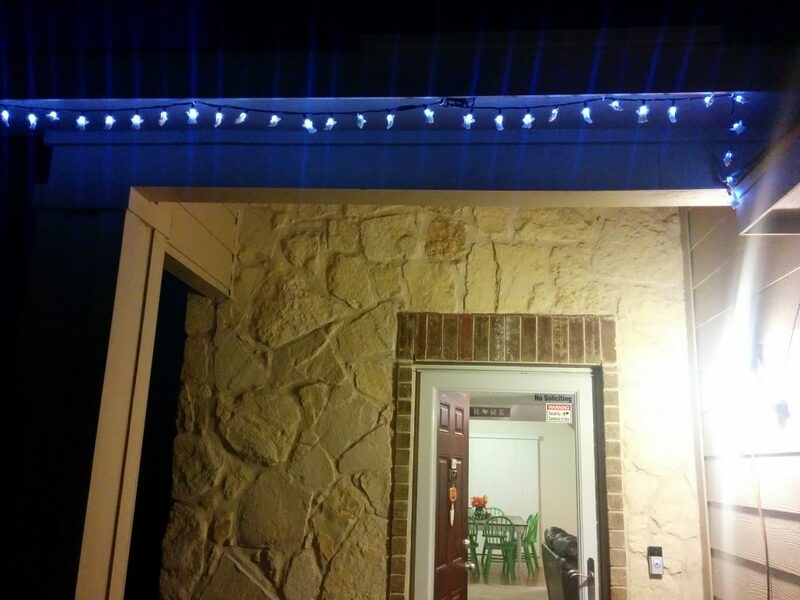 The jack-o-lantern lights are on a timer, so they turn on and off on their own. 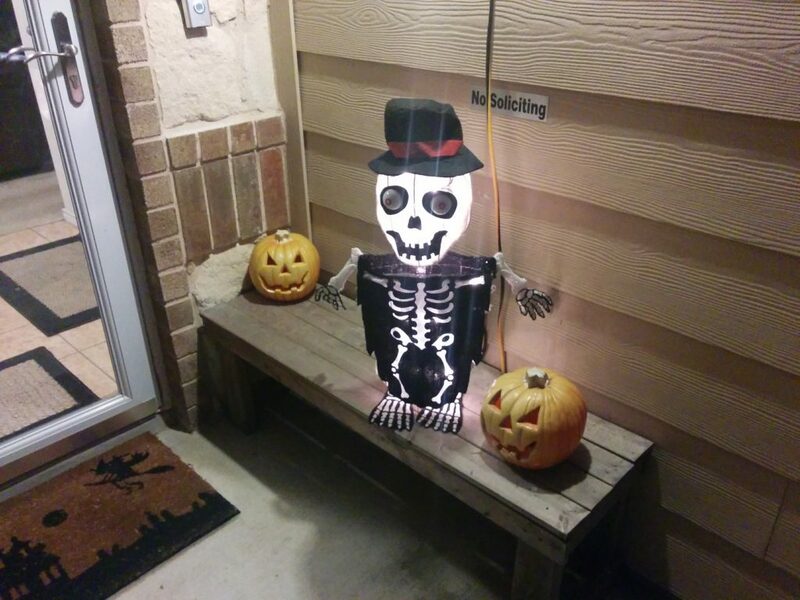 A Halloween doormat, some jack-o-lanterns, and a light-up skeleton round out the bunch. 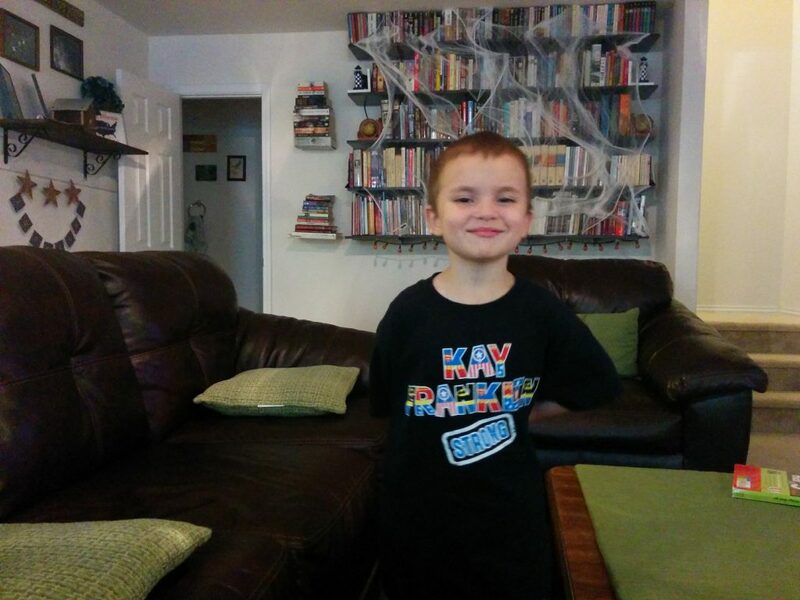 I like that we go for fun and slightly spooky for our Halloween stuff. This way, Joseph can enjoy this time of year without being too freaked out. Pausing in his playing to smile for Daddy while at National Night Out. 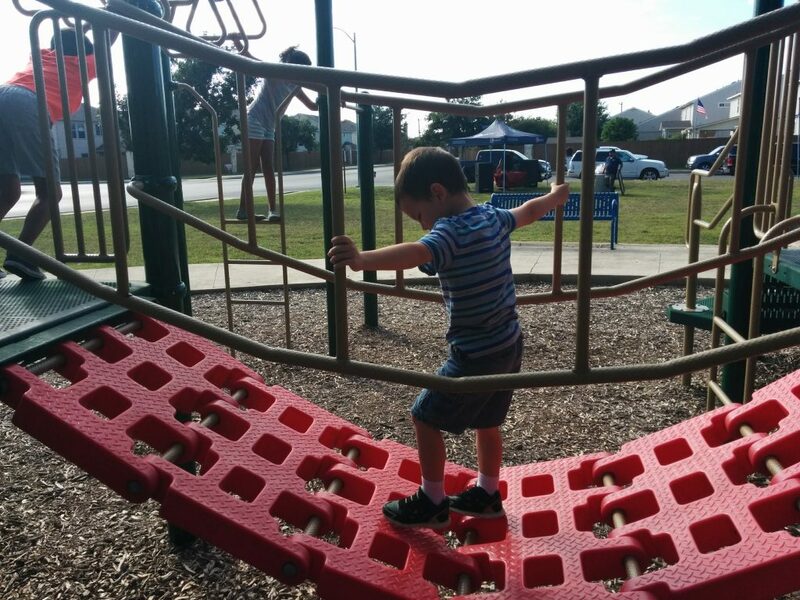 Playing on the bridge at the park. 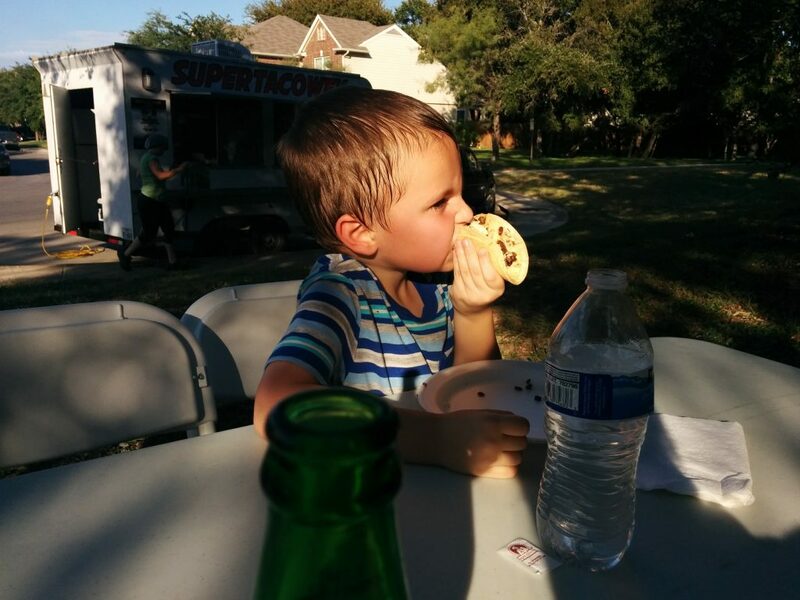 Enjoying his first taco truck taco. 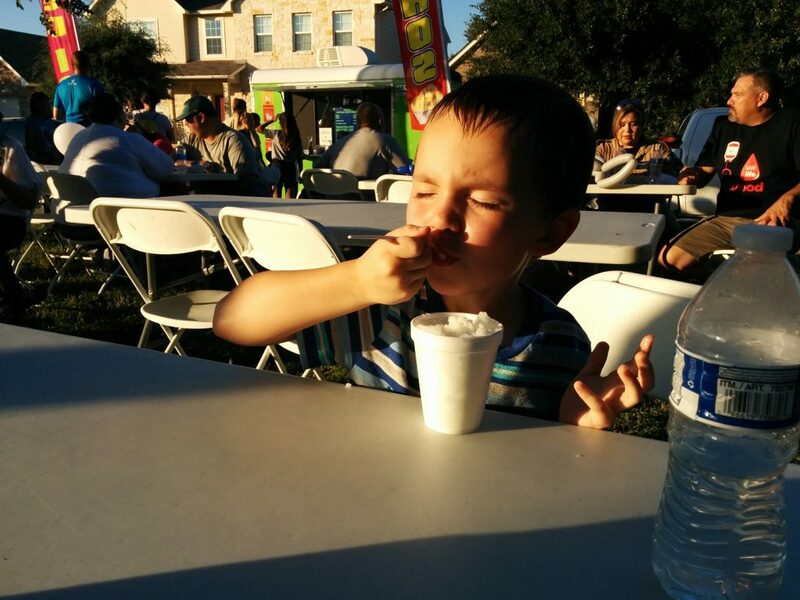 Sampling some shaved ice…while looking directly into the sun, apparently. Whoops. 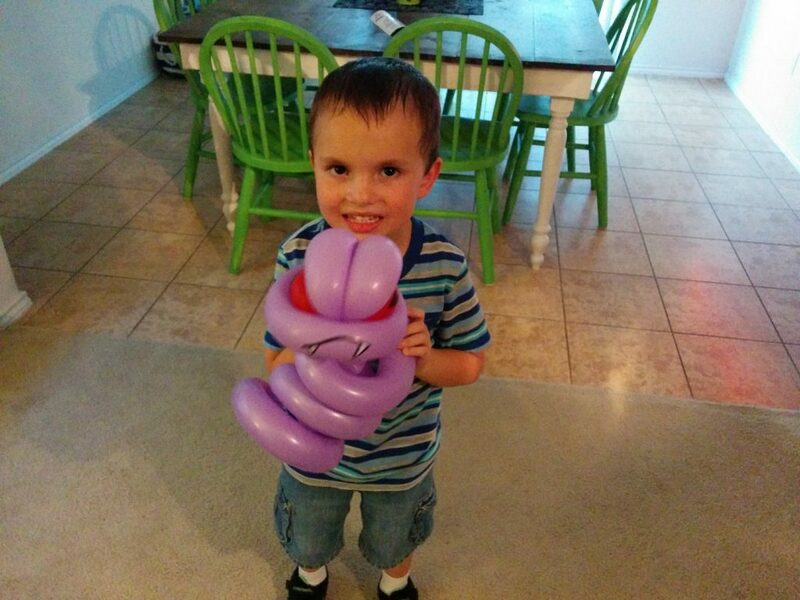 When Joseph asked the balloon artist for a snake, I was intrigued to see what the result would be. The artist overheard Joseph talking about a certain Pokémon (a purple snake), so when Joseph asked him for a purple snake, this is what the result was. 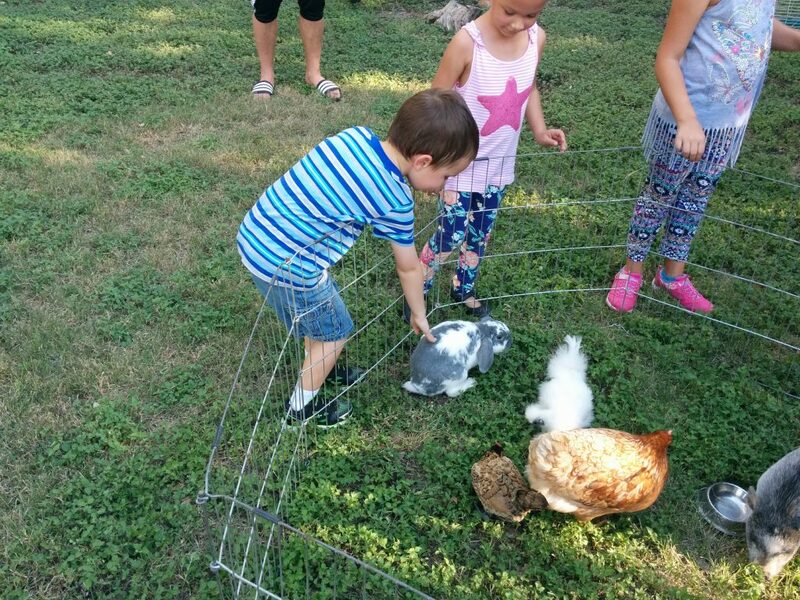 We were all rather impressed. 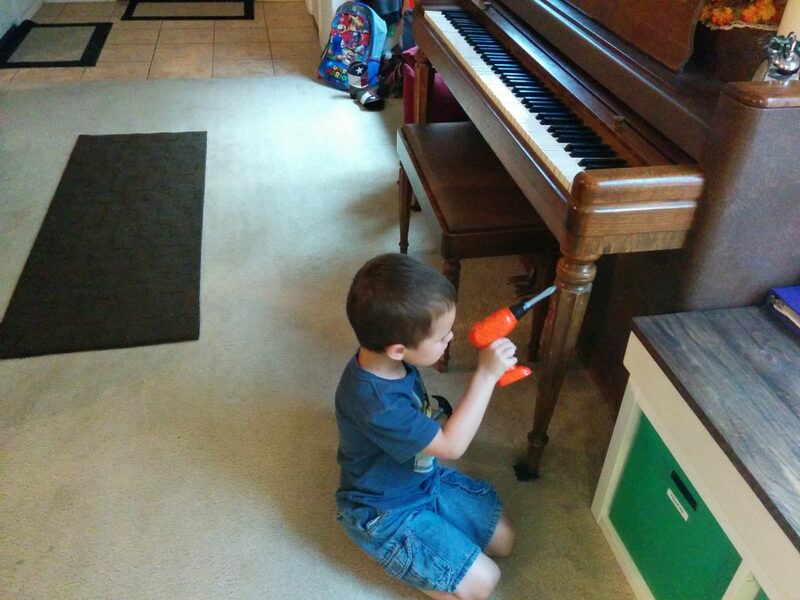 My on-site handyman can fix pretty much anything. 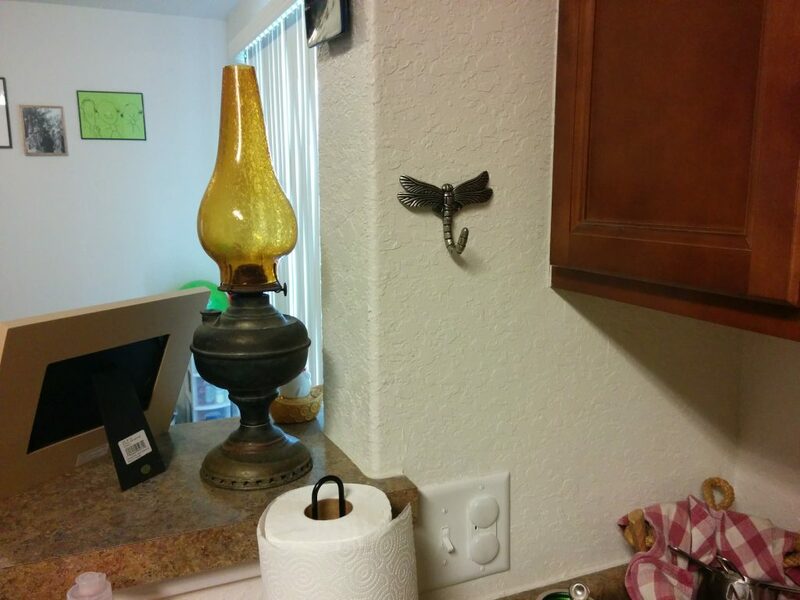 A new hook Paul hung up in our kitchen, so I have a better place to hang my dishrag while it’s drying. I love that Paul let me splurge on a “pretty” one as opposed to going with a purely utilitarian one. 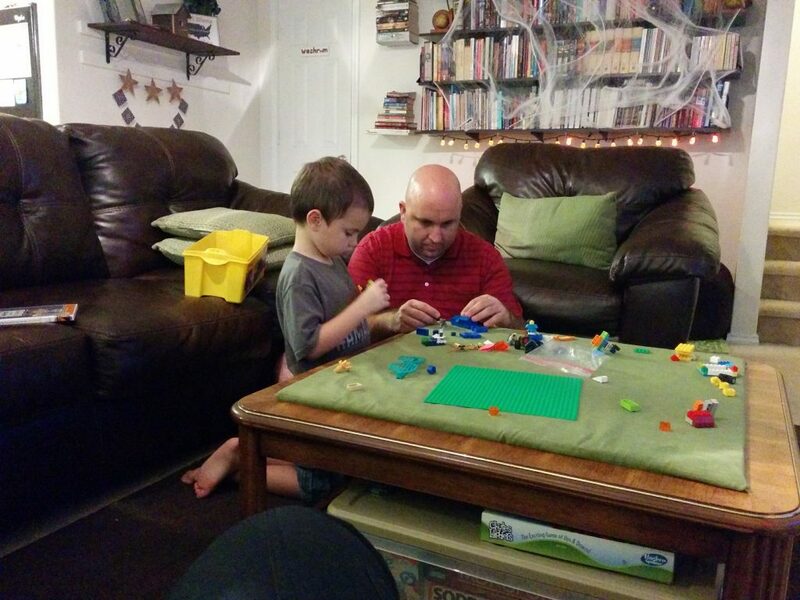 They clearly have a common love of LEGOS. I love that they can spend time together doing stuff like this! 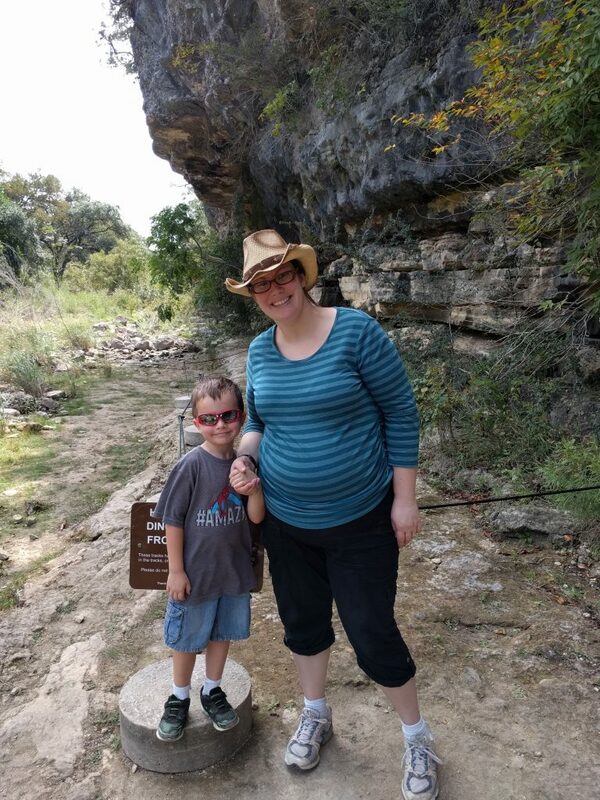 Hiking out to the dinosaur tracks. 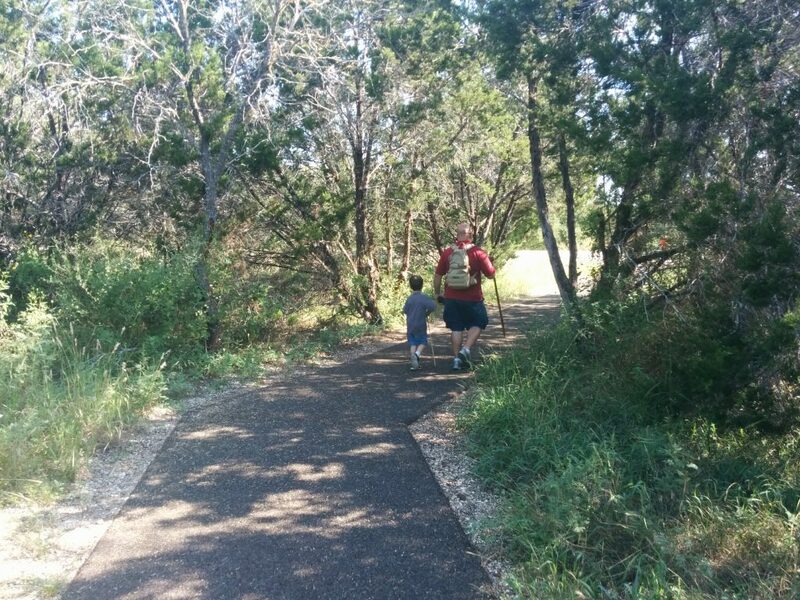 I wish the entire trail was like this (this part is right next to the park’s visitors’ center). 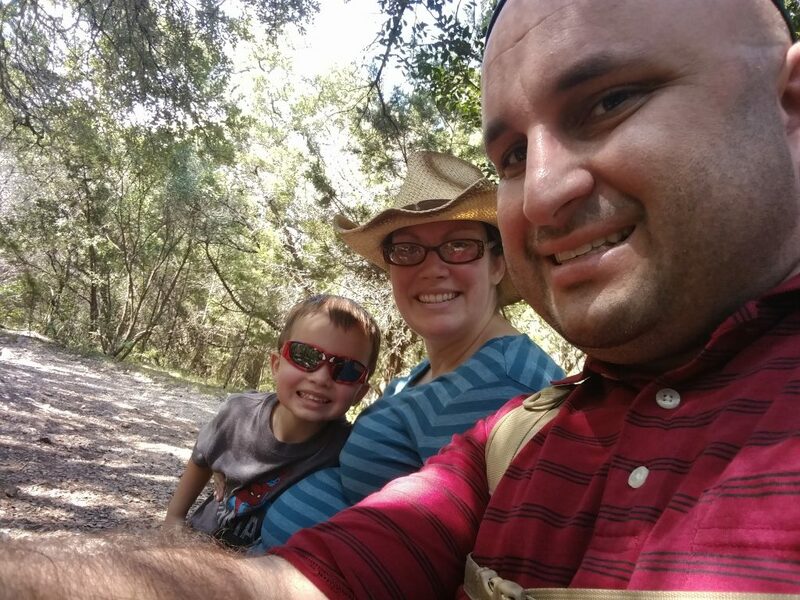 There were parts of the trail that were level and dirt, but a lot of the trail was rocky and sort of challenging to navigate at times. 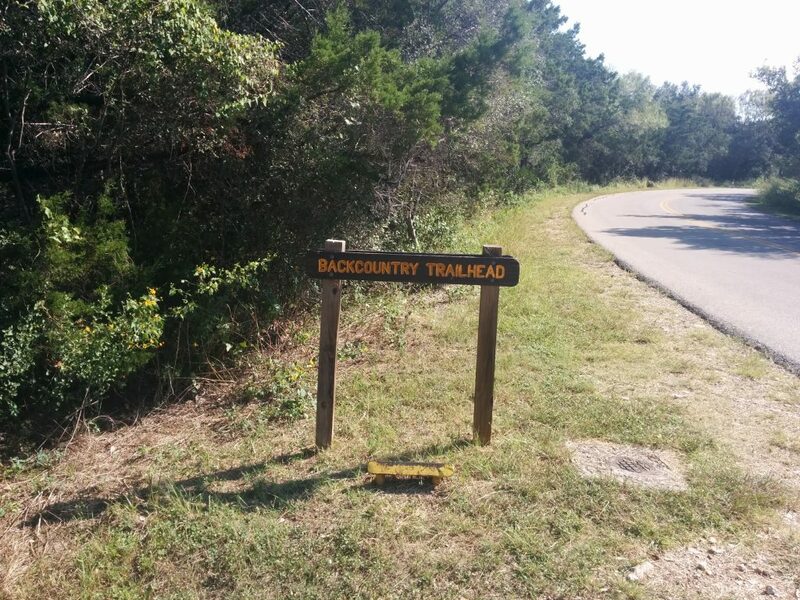 The actual trailhead to the dino tracks. 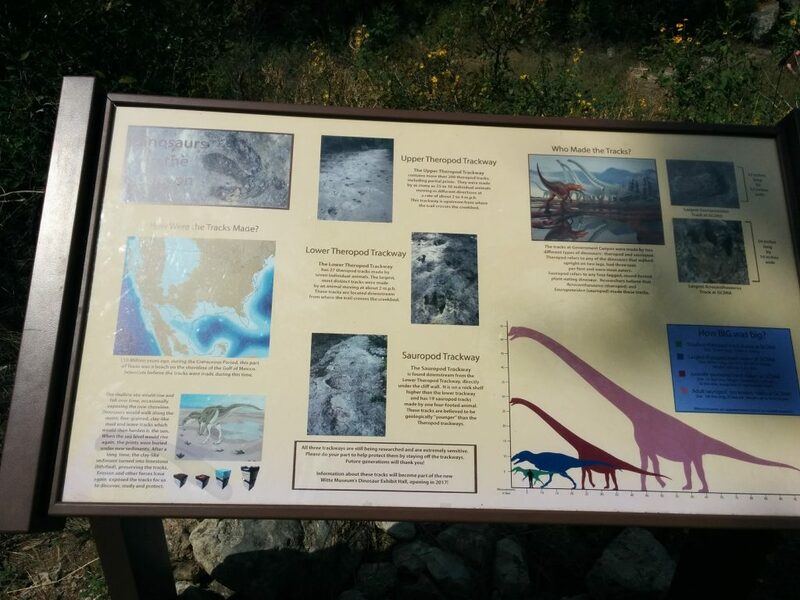 A sign near the tracks, explaining different species that may have left the tracks. 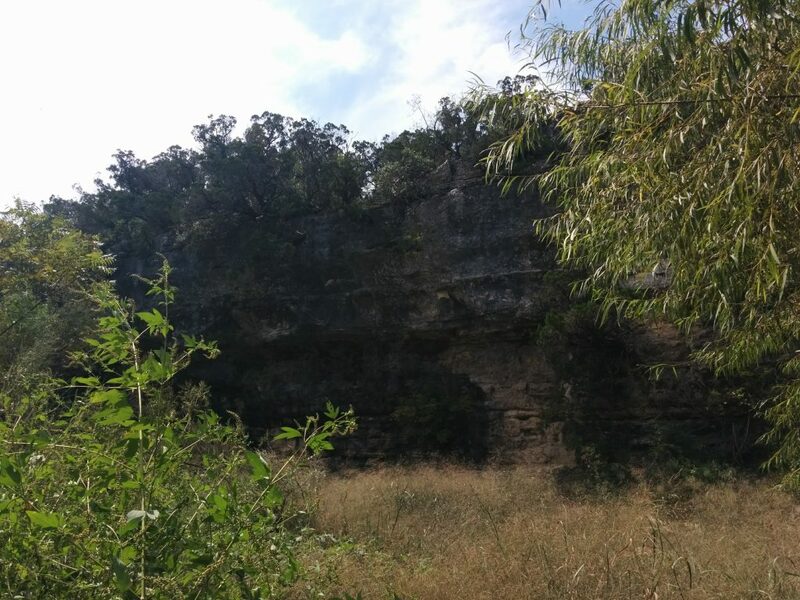 A cool cliff near the tracks. 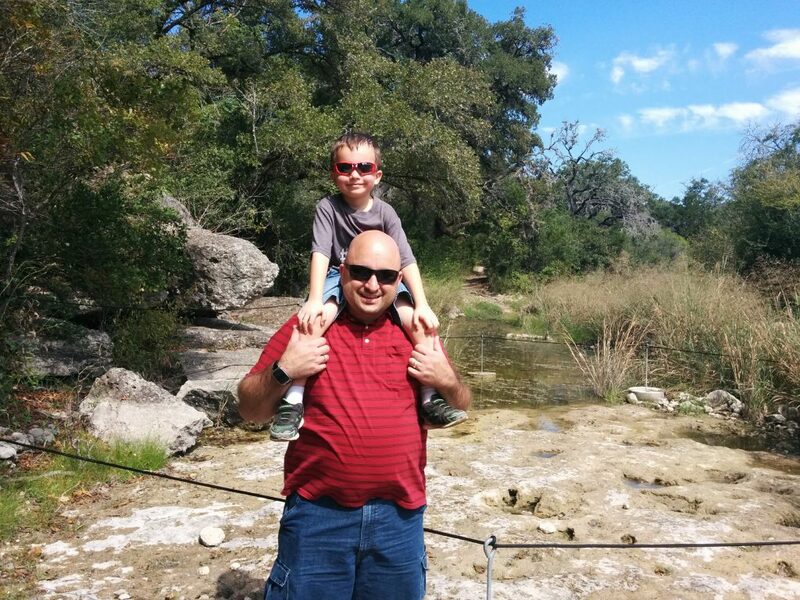 Paul and Joseph in front of some of the tracks. 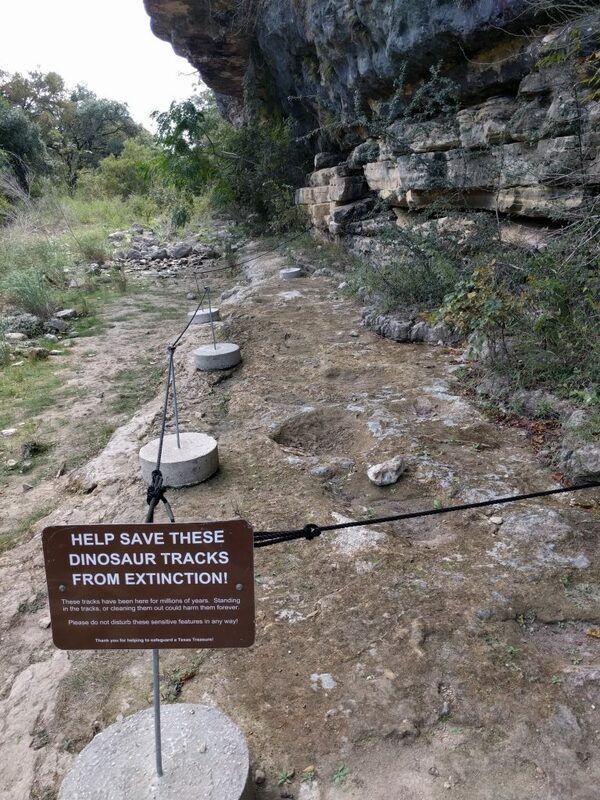 A theropod dinosaur left these tracks. He was really excited to get to see them “in real life”, as opposed to seeing the pictures that Paul showed him from when the Scouts hiked out here not too long ago. 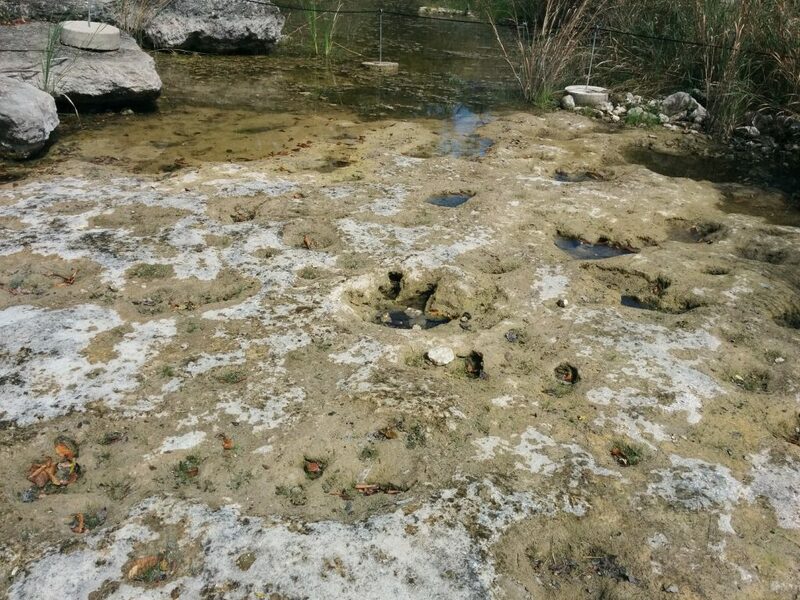 Those big indentations were left by sauropods, most likely.